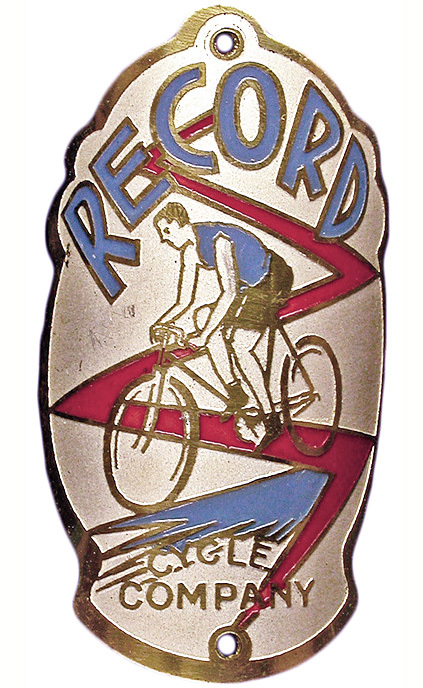 A badge for the Record Cycle Company, possibly from the Netherlands. 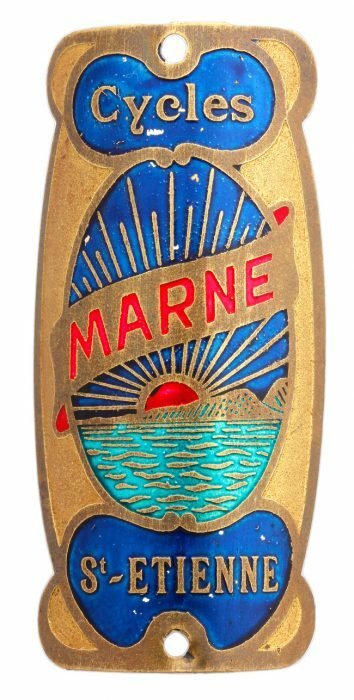 A Marne badge from Saint-Étienne, France. 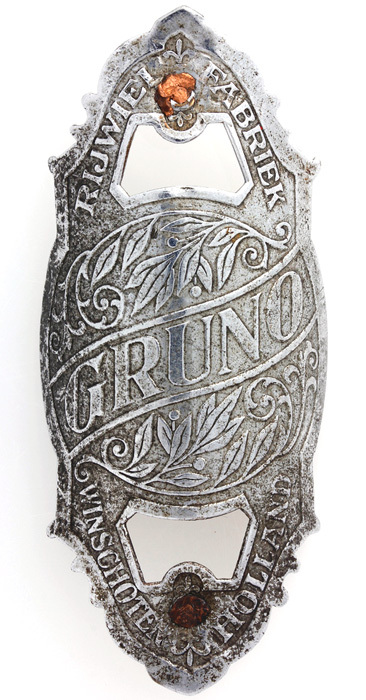 A badge for the Gruno bicycle factory, founded in 1897, in Winschoten, Netherlands. An American Beauty badge from Columbus, Ohio. 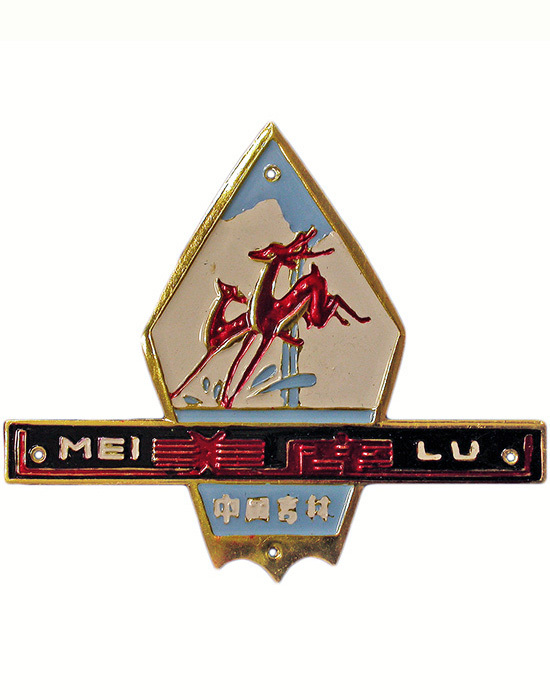 A badge for Mei Lu (Deer) bicycles from the Jilin province in China, possibly 1970s-'80s. An aluminum badge for Pionier (Pioneer) bikes from the Netherlands, circa 1970s. A badge for Hiawatha bicycles made by Gambles in Minneapolis, Minnesota, circa 1950s. A badge for The World bikes made by Schwinn in Chicago, Illinois, circa 1930s-'40s. 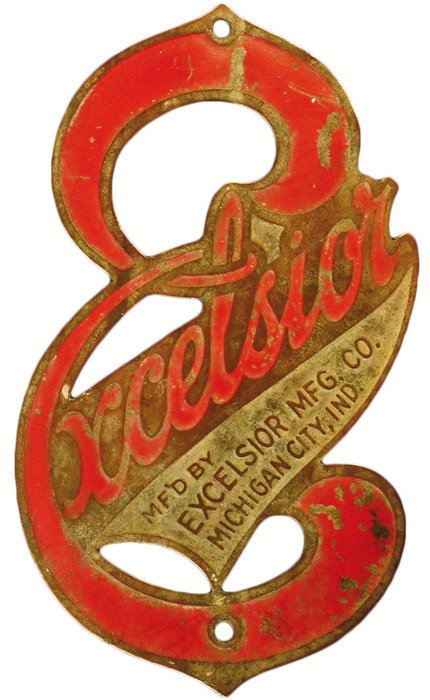 An Excelsior headbadge from Michigan City, Indiana, possibly 1920s. 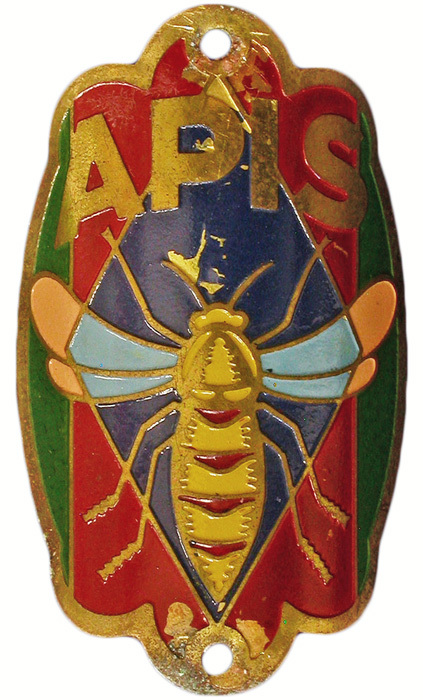 An Apis badge of unknown origin. A badge for La Fresnoise from Fresnay, France. 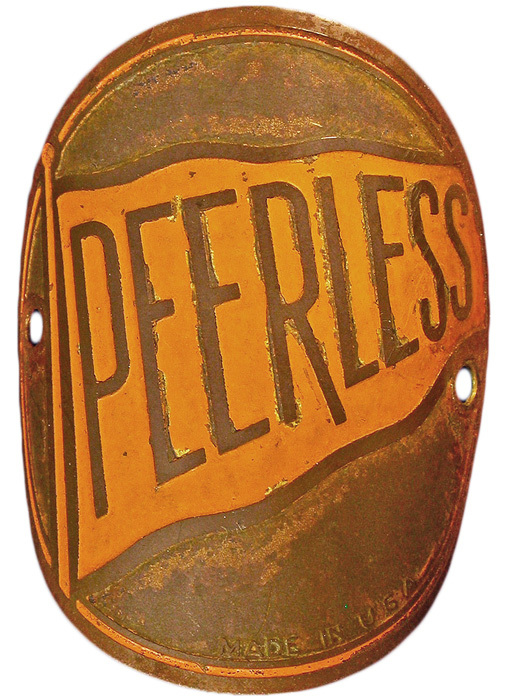 A Peerless badge made in New York, New York, by the D.P. Harris Co., likely pre-World War II. 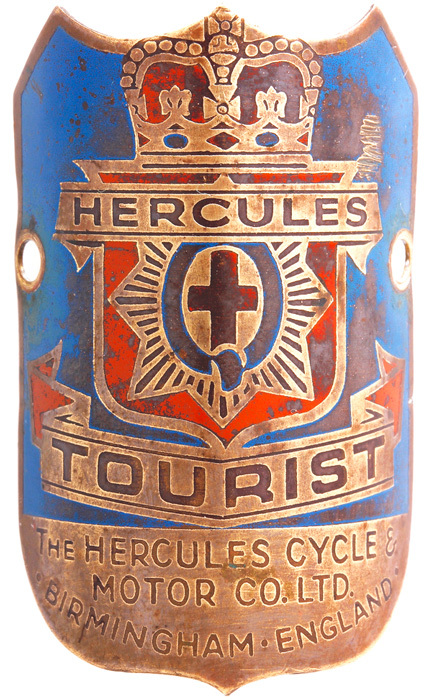 A Hercules headbadge from Birmingham, England, circa 1940s-'50s. 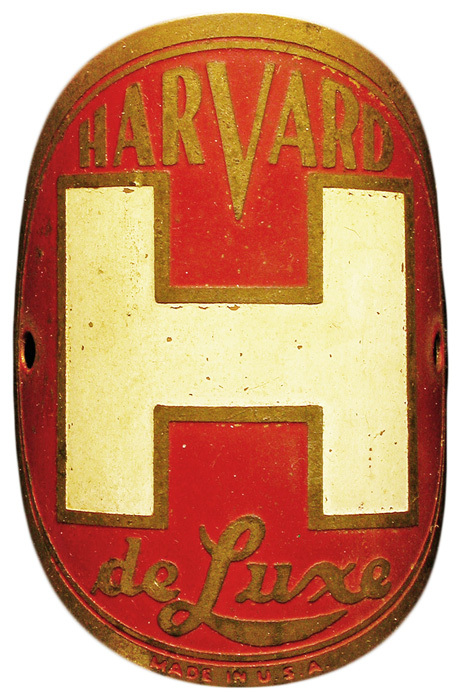 A painted Harvard DeLuxe badge, from New York, New York, circa 1940s-'50s. 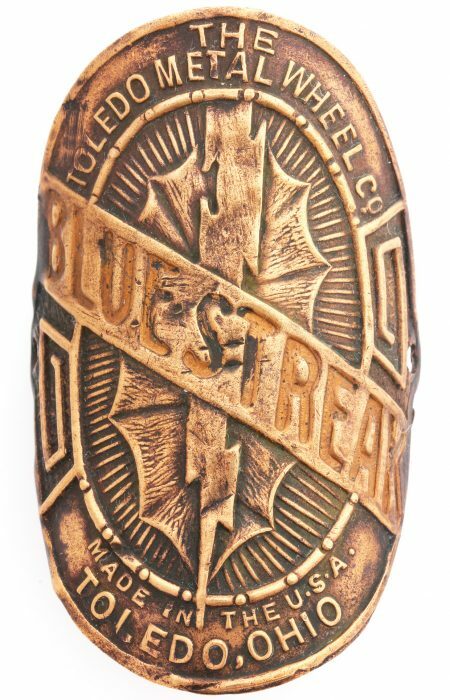 A copper headbadge for Blue Streak from Toledo, Ohio. 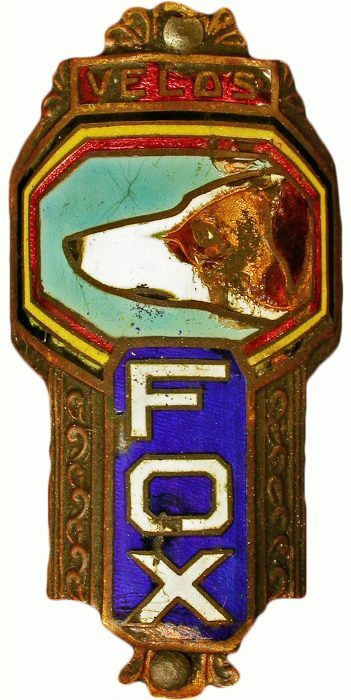 A Fox cloisonné badge from Europe, likely pre-World War II. 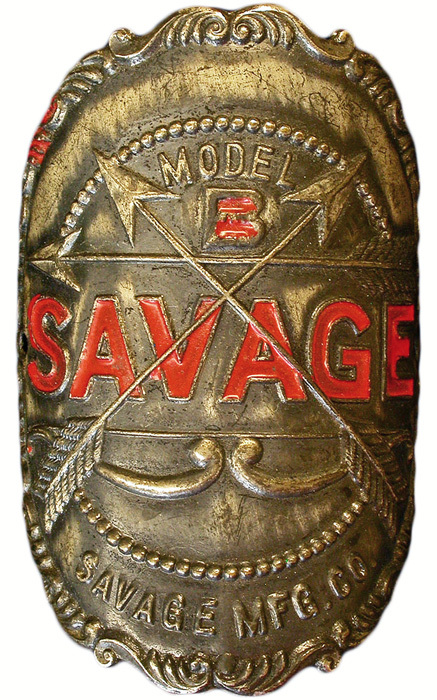 A badge for Savage "Model B" bikes, made in the United States pre-1930. 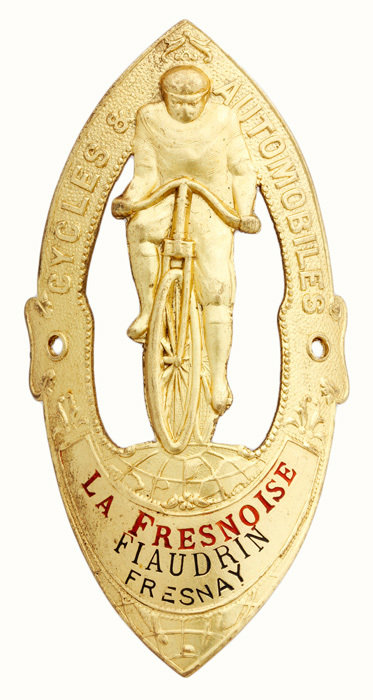 A brass cloisonné badge for Paris Cycles from Paris, France. 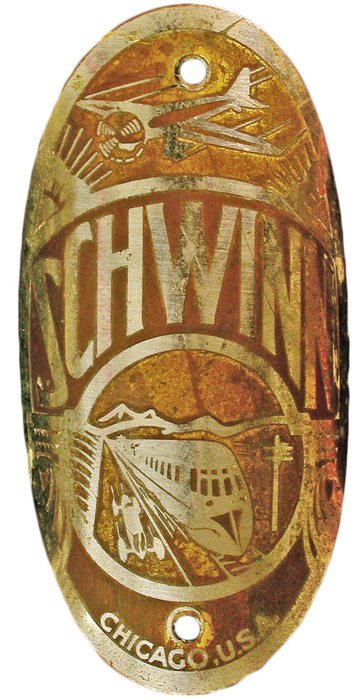 A Schwinn badge from Chicago, Illinois. 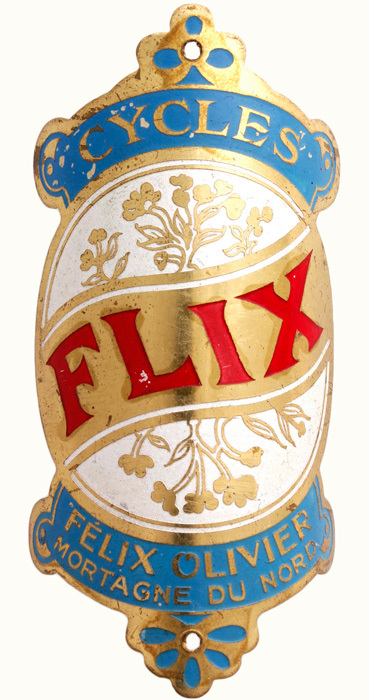 A Flix headbadge from Mortagne-du-Nord, France. 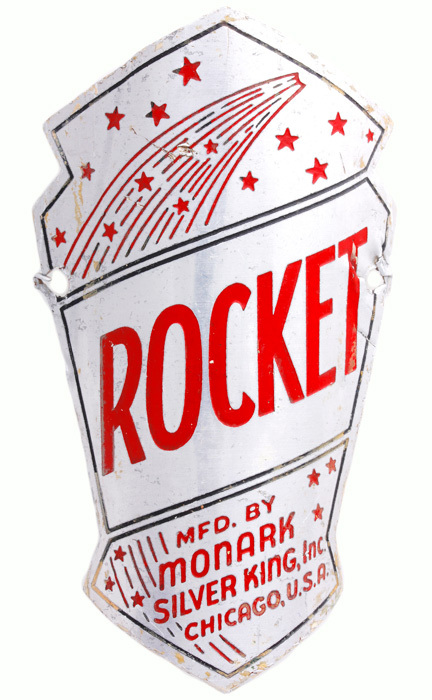 A Rocket headbadge made by Monark in Chicago, Illinois. 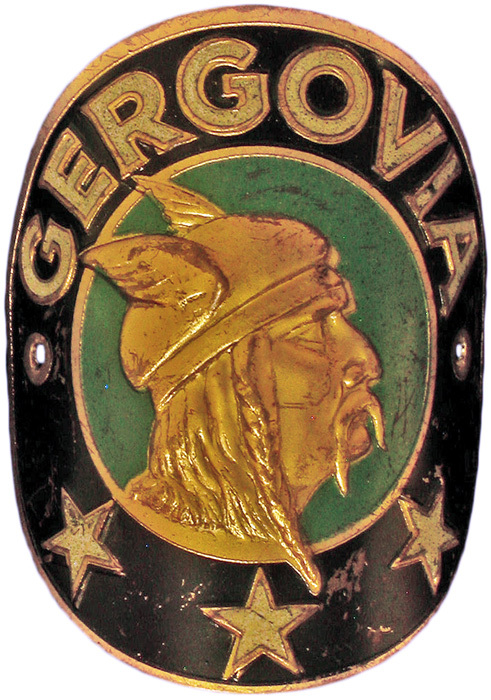 A Gergovia badge featuring a Viking warrior from Clermont-Ferrand, France. 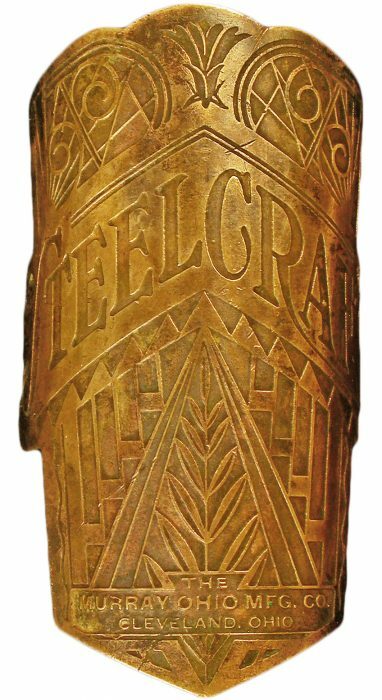 An Art Deco headbadge by Steelcraft from Cleveland, Ohio. 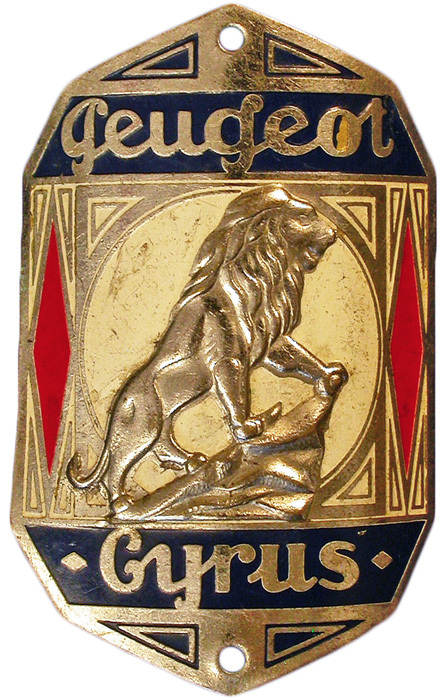 A Peugeot badge for Cyrus bicycles, referring to Cyrus the Great, made in France, possibly 1950s. A Régulateur badge from Paris, France. 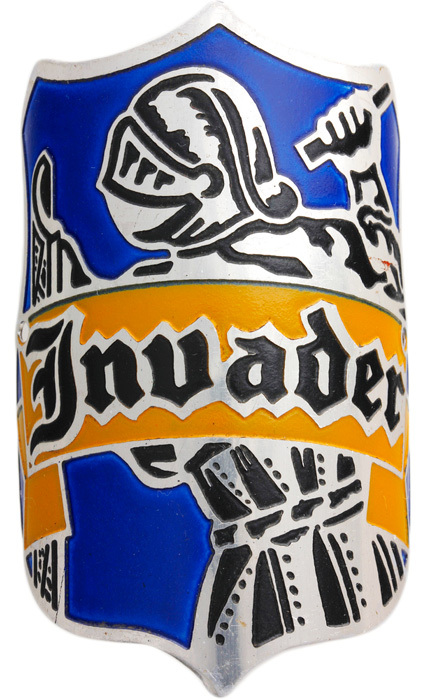 An Invader badge, source unknown, possibly 1950s. 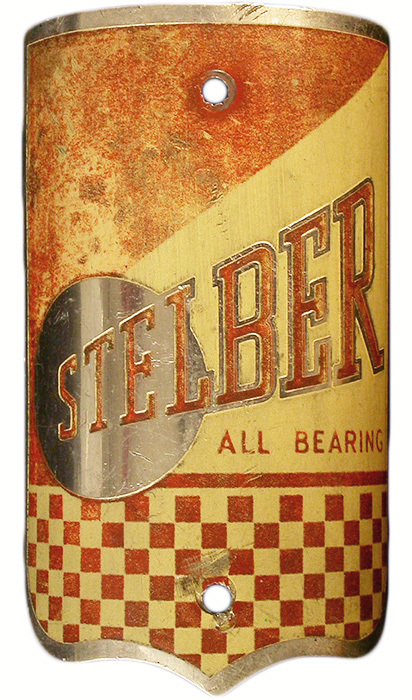 An aluminum badge for Stelber made in the United States. A Meco badge from Borlänge, Sweden. 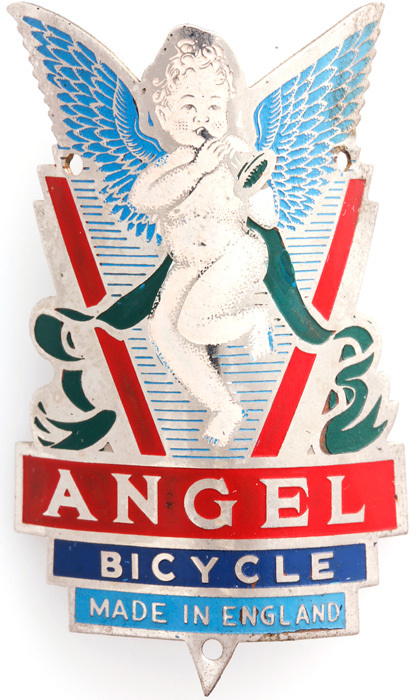 Conner believes this Angel badge might be an Asian knockoff of a British style, circa 1950s-'60s. 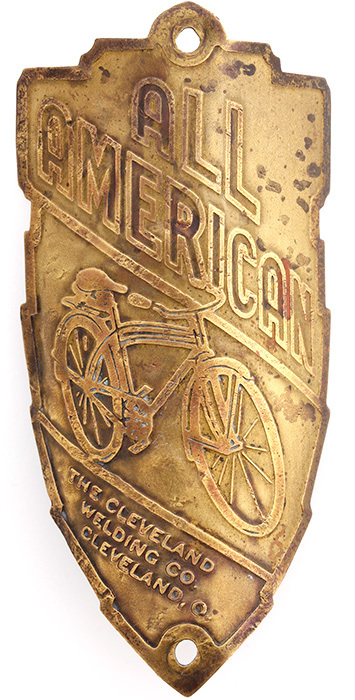 An engraved brass headbadge for the All American brand from Cleveland, Ohio. Jeffrey Conner doesn’t remember exactly how he acquired his first bicycle headbadge during a post-college gig as a bike mechanic in Seattle, but he does know it was an English-made, Rocket-brand badge someone had spray-painted blue. The metal tag had originally adorned the head tube on a bicycle frame, and like other headbadges, it was probably the only surviving part from an older bike that had been mistreated or left out in the elements to decay. Long after leaving the mechanic job, Conner hung onto the little Rocket talisman, toting it with him as he moved across the country and embarked on a career as an evolutionary biologist. Only decades later did Conner realize that bike badges were available in abundance on eBay, and his casual interest quickly blossomed into an obsession. 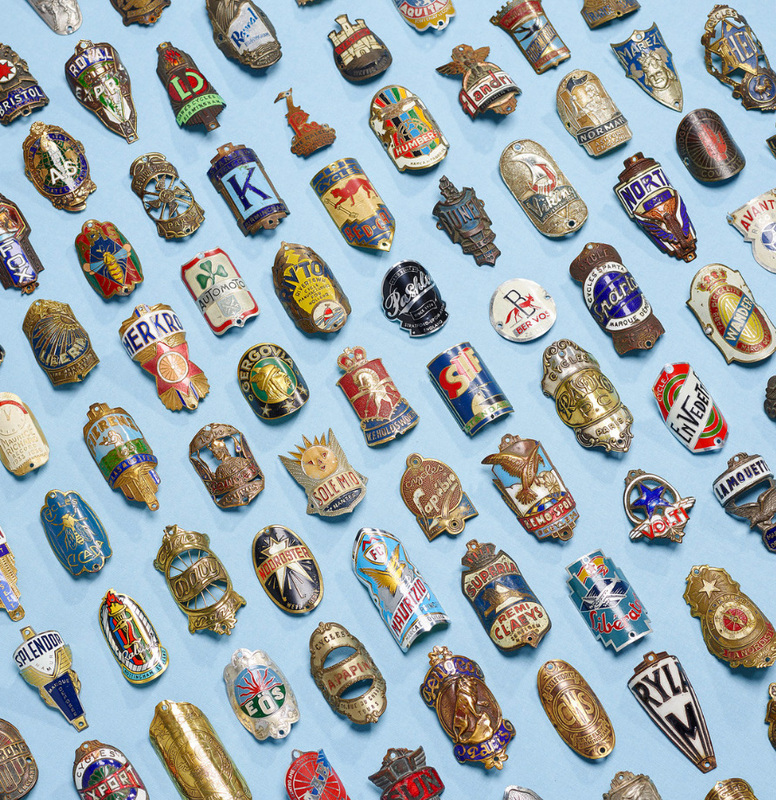 Today, Conner has more than 1,000 headbadges in his collection, which he meticulously documents and shares on his personal flickr as well as a group for fellow collectors with more than 800 members. In 2016, Conner’s collection also became the basis of a small book entitled A Cycling Lexicon, featuring photographs of the badges alphabetized by brand name. Originally produced by Carter Wong design, the book was later republished by Ginko Press. Though the headbadge’s debut is a bit murky, its heyday aligned with the bicycling boom of the late 19th century, when hundreds of new bike companies popped up across the developed world to satisfy demand for the so-called safety bicycle. “Around the late 19th and early 20th centuries, in Europe and the United States, even small towns had their own bicycle manufacturers,” Conner explains. 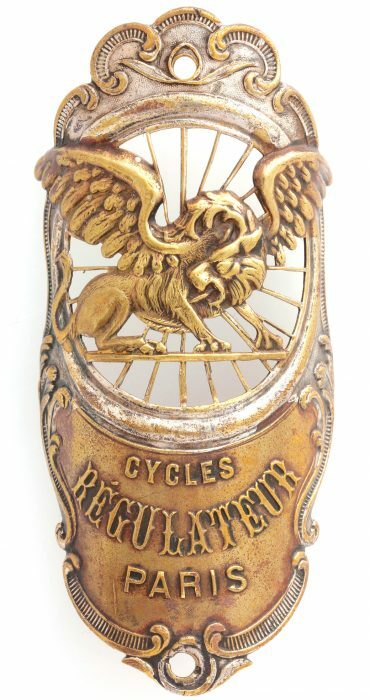 “French and Belgian badges often had their town’s name on them, but small bike businesses were scattered all over the place.” As competition increased, headbadges were adopted to give brands a unique identity and build customer loyalty. In 1898, due to problems with oversupply and competitive pricing in the American bike market, dozens of manufacturers joined together to form a giant trust called the American Bicycle Company (ABC). Although ABC failed a few years later, other successful companies like Pope, Schwinn, and Raleigh followed its lead and bought up hundreds of small bicycle brands. “There was a tremendous consolidation in the 20th century, similar to the car industry,” Conner says. Conner’s first headbadge was this pressed-aluminum Rocket piece. 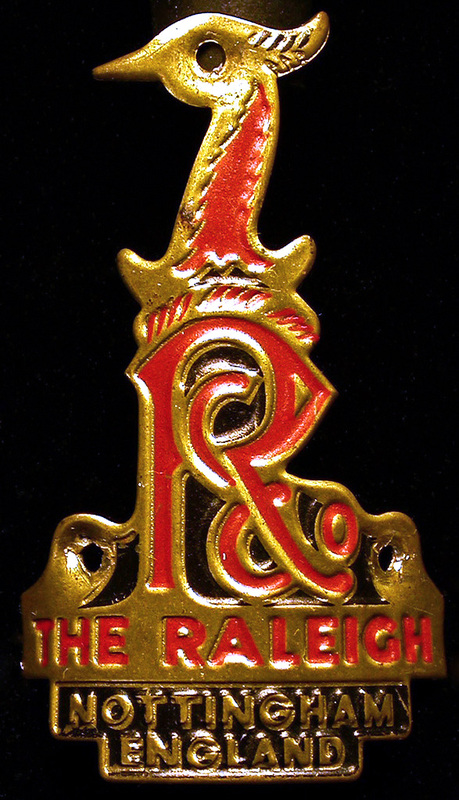 A version of Raleigh’s heron badge, circa 1960s-’70s. 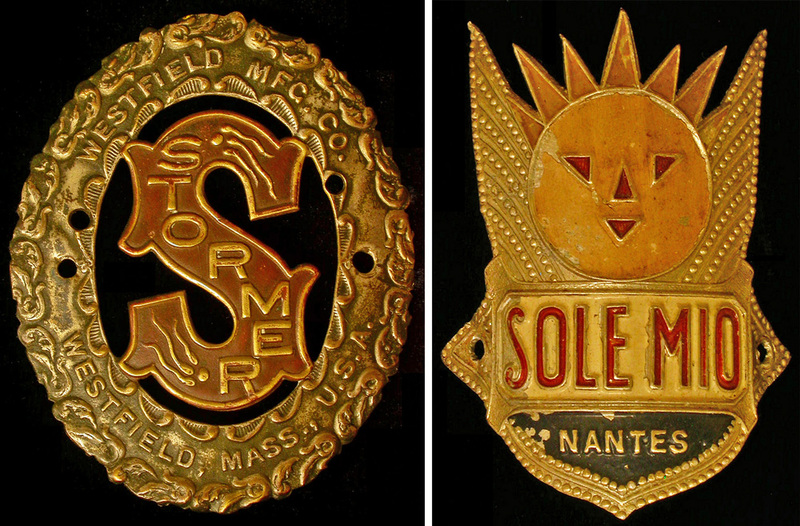 Left, a brass Stormer badge from Westfield, Massachusetts, with its unique sperm-and-egg depiction. Right, a graphic Sole Mio headbadge from Nantes, France. 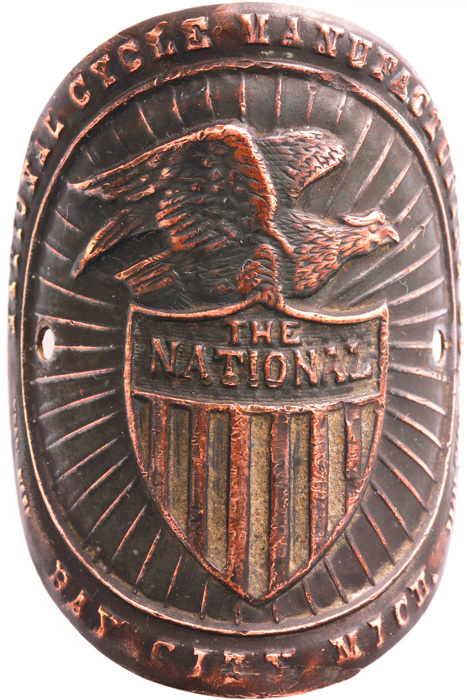 A headbadge for the National Cycle Manufacturing Co. from Bay City, Michigan, circa 1900. If a bicycle is badged as Gergovia, that warrior is a Gaul, not a Viking. As our Asterix books tell us, the Gallic leader Vercingetorix led his forces to victory against Caesar’s Roman forces at Gergovia in 52BC. A wonderful collecting focus highlighting an otherwise overlooked type of industrial art. Such diversity! Very interesting. N°22 isn’t a Viking but a Gaul, probably Vercingétorix, who win a battle against Julius Caesar at Gergovia. I like the book , there are nice pictures. The only problem is that there is no information about factory and country where they where made . I would be nice if a list was published on the internet . I own collection of 2750 head badges if there are other collectors inserted in headbadges there is a Facebook group withe te name . “ ” Several diplomats decided to do the honorable thing—not to follow the rules and orders given by their foreign ministry.